RV-9A Empennage - Page 2. EMPENNAGE KIT - Page 2. Here are the first pictures from my new digital camera. I bought the Fuji FinePix 2650 with 3x optical zoom lens. I realized that the high-resolution photos were making the dial-up load times too long, so I gave in and let Front Page 98 do some compression, and it shows in the pictures. Revised the resolution of photos on 1/15/03. 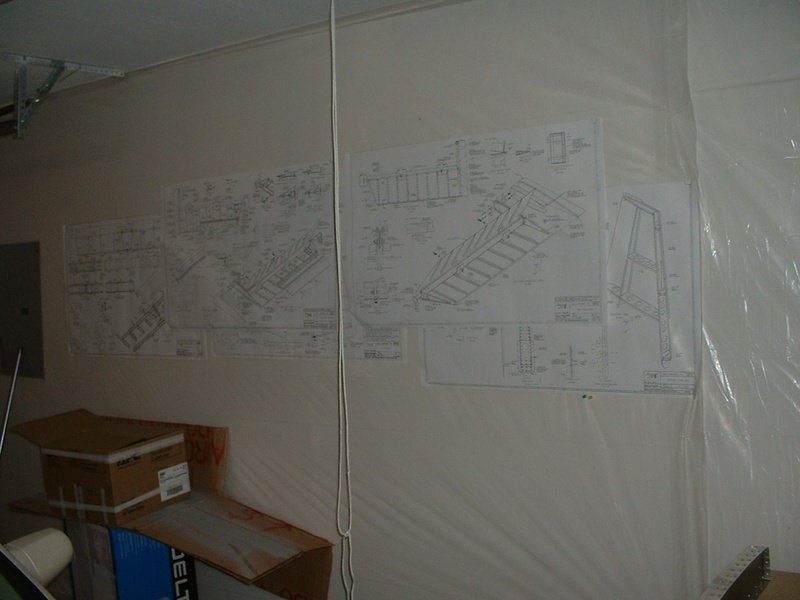 The large-sized plans I have been using are stapled to the garage wall. 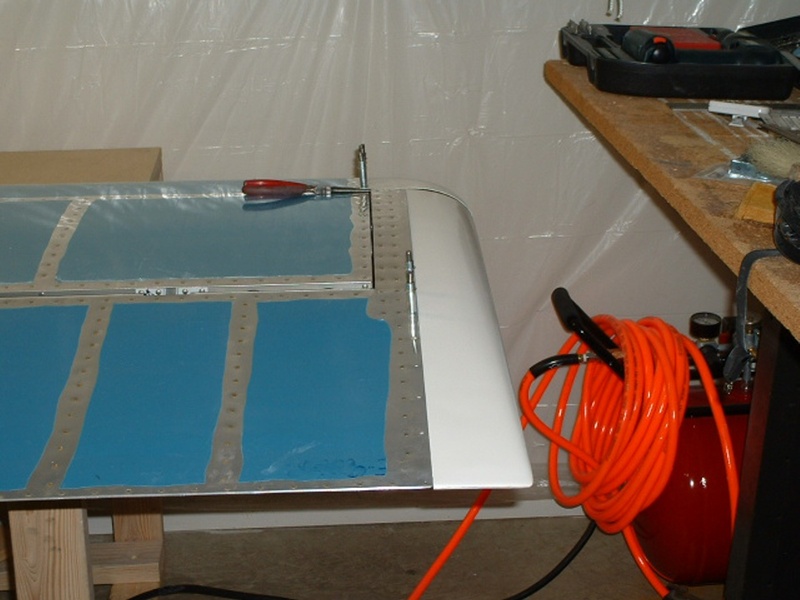 The plastic sheet attached to the wall protects the drywall from flying dust, spray, etc. The horizontal stabilizer with the right elevator temporarily attached is hanging from the ceiling at the north end of the garage. The rope hanging from the ceiling in the foreground is for those times when I need an extra pair of "hands" to hold on to something too big to sit on the work table. That yellow and black roll-around tool box came from Wal-Mart and I stocked it with all the aircraft specialty tools. 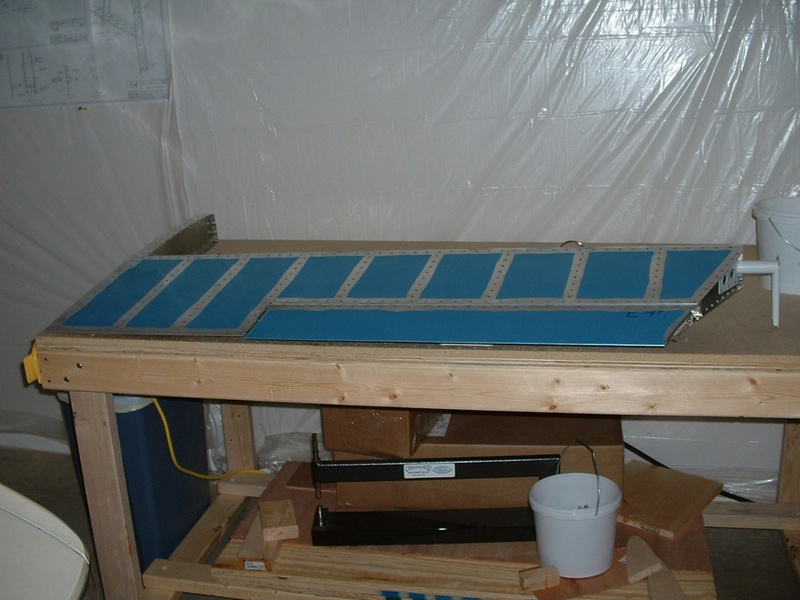 Here is the left elevator with the protective blue plastic film still in place to minimize scratches to the aluminum skin. My C-frame for dimpling skins is down below the work table on the storage shelf. A bucket of clecos is down there and another bucket of them are up top. October 14, 2004: I have gone back into my photo archives and brought out some old photos that were not on the original version of this web site. Now that I have plenty of server space, I have replaced the photos that were compressed too much and I have added some "new" photos showing some of my mistakes in hopes that others will avoid some of the pitfalls. These photos were taken December 29-31, 2002. The first one shows how I had to use Cherry Max pop rivets in a few places where I had no success putting in hard rivets. The top and bottom rivets are replaced on the RIGHT side nose rib flange to the front horizontal stabilizer spar. Here is the backside of the spar from the photo above. The central shaft of the Cherry Max rivet is visible at both locations on the rib flange. I was able to squeeze all the rivets except for those in the corners. Knowing what I do now, I would have riveted in the nose rib and the main rib to the spar before beginning to put the skin on the assembly. That would have given my rivet squeezer the room it needed to do those "corner rivets" the proper squeeze angle they needed. This one shows the front spar on the LEFT side nose rib of the horizontal stabilizer. I only needed to replace ONE bad hard rivet on this side. For you beginning builders, notice that there are NO HOLES in the "foot" of the aluminum angle in these photos. Each one of these angles gets TWO holes later when it is time to "DRILL IN ASSEMBLY" when mounting the horizontal stabilizer to the fuselage. Here is the back side of the LEFT inside rib of the horizontal stabilizer. No, you are not imagining things here, there is one hard rivet that is put in from the opposite side of the spar. I was able to get this one in better from the other side -- NO Cherry Max rivet here. As you can see, I had some rivet gun alignment problems and ended up with some "cup marks" on some of these locations. Not all the rivets could be squeezed. 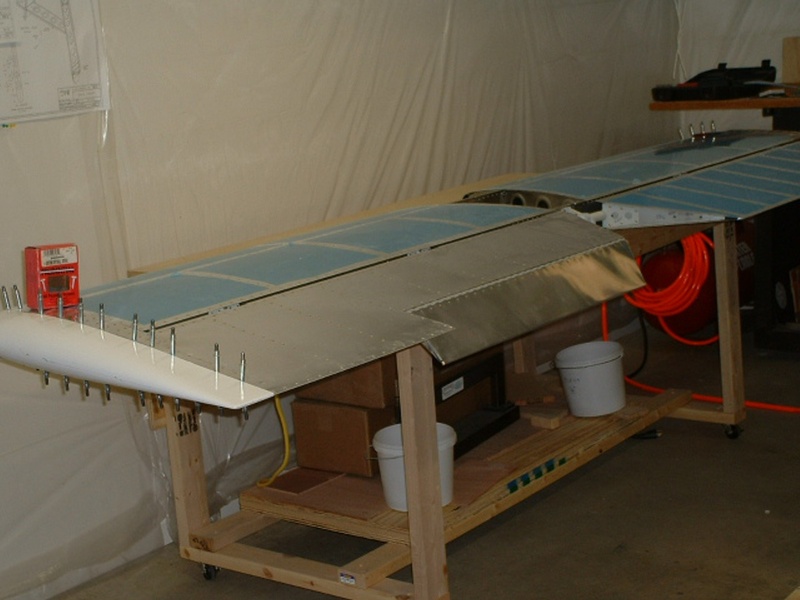 The vertical stabilizer with rudder attached is sitting in the living room. I normally have it up against the wall between the two front windows, but pulled it out into the room for this shot. I hope to finish all the metal work this weekend and may put the fiberglass tips on things later, or not. The wing kit is due in early January. 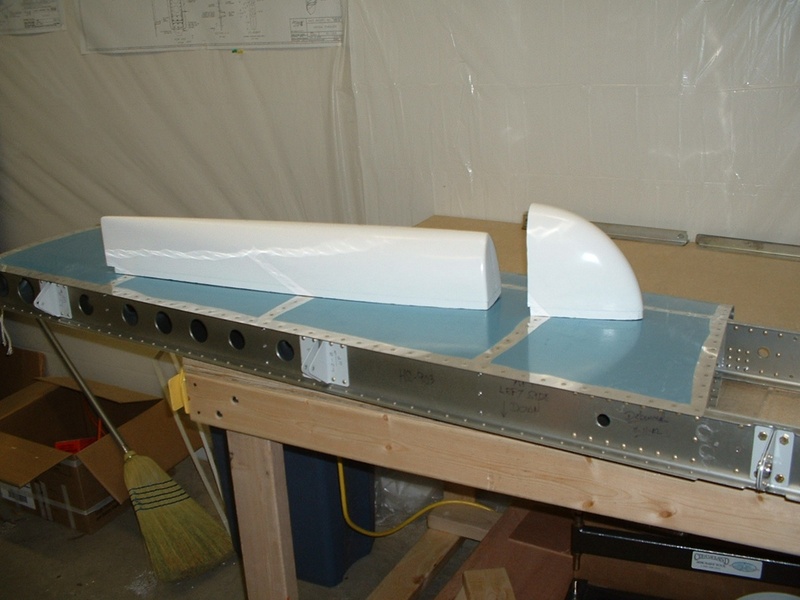 December 31, 2002: I cut the fiberglass tips for the left elevator and the left side of the horizontal stabilizer to fit today. 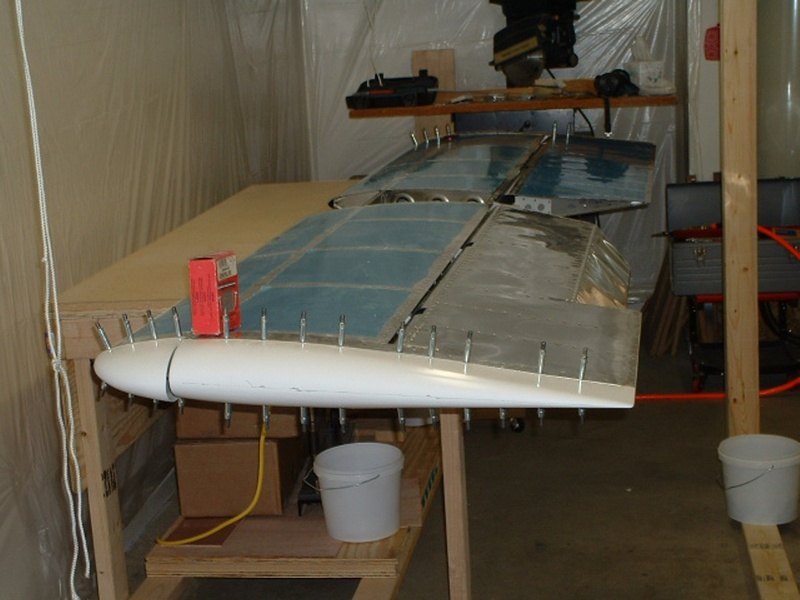 January 2, 2003: I trimmed the other fiberglass tips for the horizontal stabilizer and elevator, then match-drilled all four parts. I also started to fabricate the balsa plank to fit the back side of the left horizontal stabilizer tip. Here is the other end of that same bolt on the other elevator torque arm. The head of the bolt would not turn in the first hole before I "elongated the hole after the rod end bearing adjustment. The bolt head is hiding the view of the oval-shaped hole. CLICK HERE for Wing Kit - Page 3. Return to MAIN MENU.